The YouTube subpocalypse is for real and my YouTube channel could use your support. I need 1,000 subscribers to survive and it's at 709 subscribers right now, an increase from when the bad news broke, but I still need 291 more. While the revenue generated is small compared to a Game Grumps or a NoDQ it's still very much necessary to keep our operation running. Please subscribe to Mistah MegaManFan and help me out! 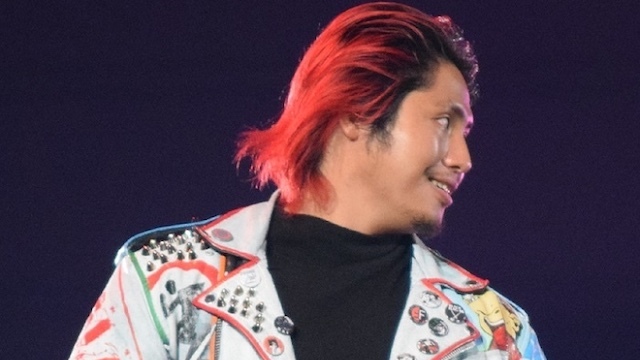 Here's the latest on Hiromu Takahashi from New Japan: "Hiromu Takahashi has been hospitalized after suffering a neck injury while facing Dragon Lee in the IWGP Junior Heavyweight Championship match on Saturday night's G1 Special in San Francisco. It is reported Takahashi after the match was immediately taken to a nearby hospital. He is currently undergoing a thorough evaluation, Takahashi is conscious, and is able to sit and talk. We at New Japan Pro Wrestling deeply appreciate our fans' sincere concerns. Please keep checking for updates as we learn more." Via Instagram The Rock is staying busy promoting his new movie: "Eagle has landed - NYC. Arrived hotel suite at 345am and wide awake from 17hr flight from China. Big shout to my ace @sevenbucksprod assistant @jesszobler for always making sure my work space is ready to go. I'll work here til the sun comes up then go hit the gym. And by 'work', I mean I'll pull up cat videos on this inter-web thing. #HereKittyKitty #KickingJetLagsAss #WorkSpace #NYC #SkyscraperGlobalPressTour." Here Eric Bischoff comments on a potential WWE return: "I would love to do it if it was a situation which would work for everybody, a character like mine, there is only so much you can do from a storyline perspective. You can be that heel authority figure which I was for a few years in WWE and WCW, and it's interesting and it's fun but after a while you've kind of done everything you can do creatively. I'm pretty realistic about the value my character has now. I'd like to manage someone, a young talent that maybe doesn't have the mic skills. I think that would be fun because I can still get heat." * Raw Tag Team Champions Bray Wyatt and Matt Hardy retained over The B Team and Titus Worldwide. * WWE Cruiserweight Champion Cedric Alexander retained over Buddy Murphy. * Ronda Rousey, Nia Jax, Bayley, Natalya and Ember Moon defeated Mickie James, Alicia Fox, Sarah Logan, Liv Morgan and RAW Women's Champion Alexa Bliss. * Bobby Roode defeated Mojo Rawley. * Kalisto, Lince Dorado and Gran Metalik defeated Drew Gulak, Brian Kendrick and Jack Gallagher. * WWE Intercontinental Champion Dolph Ziggler retained over Finn Balor and Seth Rollins. * Roman Reigns, Bobby Lashley and Braun Strowman defeated Kevin Owens, Elias and Baron Corbin. * Jimmy Havoc vs. Brody King. * Battle Riot: Tom Lawlor, John Hennigan, Kevin Sullivan, Jimmy Havoc, ACH, Davey Boy Smith Jr., Teddy Hart, Rich Swann, Pentagon Jr., Jimmy Yuta, Low Ki, Brody King, Jake Hager, Swoggle, Lance Anoa'i, "PCO" Pierre Carl Ouellet, Konnan, Joey Ryan, Sami Callihan, Jason Cade, MJF, Rey Fenix, Head Shrinker: Samu, Kotto Brazil, Aerostar, Drago, MJF, Leo Brien, Michael Patrick, Rey Fenix, Vandal Ortagun, Simon Gotch and more to be announced. 1:00 PM ET. Dolph Ziggler on what being six tiem IC champ means to him: "I used be like, 'I don't get these chances that other people get.' And after 12 years and 6 championships, Intercontinental champion, and plus a bunch of other stuff, you go, 'I get the opportunity. I get them.' We don't always follow up on them, but that's part of the business and sometimes you're not meant to be a long term person. Everytime you get something, I go, 'Wow, I was just focusing on being a tag team wrestler, which I haven't done in years and became champion. How can I make this the most memorable thing I've done in the last 10 years?' So I immediately went to work and I was focusing and I was watching different kinds of movies or studying different wrestlers from the 70s and 80s. I go, 'How can I make this different?' Because Seth's done an awesome job. We're not really tight, we're not really close, but I know that he's awesome at his job also and it's great to see what he's done with that title." Here Paige comments on being pie-faced by a fan last month: "Every time I fly to Chicago there's always like thousands of fans anyway, they're all diehard fans which is great, but you always get one d---, right? So while I'm tagging people's hands he comes along to like shove his hand in the car to like pie-face me. So, everyone who seen it, it was like slow motion and he put it on the end of my nose and I'm like, 'what the f--k?' Then he told me to, 'lose some f–king weight b—h.' I was like Clueless, 'as if?' Yeah. So that happened and I remember I got in the car and I was so mad about it but I was like, 'you know what? I've had a very s--tty year-and-a-half and I really need to get my s–t together. Because if I blow up right now it's definitely gonna be on the internet and it's gonna be Paige being the bad guy. So I was like, 'alright I'm gonna relax.' I texted Mark Carrano because obviously he's our boss and I was like, 'this is what happened out here, just to let you know.' I was really upset about it because you know you can never make everyone happy. You're either too skinny or too fat. And you know how you get angry tears? It was like angry tears like grrr." * Thursday 7/19 at 11:15 AM - WWE Mattel Panel in Room 6A featuring Matt Hardy, Zack Ryder, Curt Hawkins, Cathy Kelley and more to be announced. Promotional material for the panel notes, "The WWE Elite Squad invades San Diego Comic-Con! Elite Squad members Zack Ryderand Curt Hawkins will be joined by Matt Hardy and a surprise superstar or two, along with the Mattel team, for this collector panel moderated by WWE correspondent Cathy Kelley. Get the scoop on the hottest new Mattel WWE action figures!" * Thursday 7/19 at 1 PM - "Strange Bedfellows - Wrestling & Comics" in Room 29AB - "Some have called the spectacle of pro wrestling "a comic book come to life." That is not so far from the truth. From the heroics of Hulk Hogan to the anti-heroics of "Stone Cold" Steve Austin and the villainy of Ric Flair, this panel explores the parallels in character development and storyline advancement between these forms. Featuring Rik Offenberger (First Comics News), Francis Szyskowski (The Massacre Twins), Scott Lost (The 2nd Shift), Michael Kingston (Headlocked), Kevin Kleinrock (Masked Republic), Flobo Boyce (Legacy), and Anthony Ray Bench (Film Threat). Moderated by Joshua Waldrop (Red Guerrilla Media)." * Headlocked Comics will host Rey Mysterio, Jerry Lawler, Lita, Psicosis and Joey Ryan at their booth (#1901). Psicosis will be appearing on Thursday 7/19. Jerry Lawler, Rey Mysterio & Amy "Lita" Dumas will be appearing on Friday 7/20. Saturday 7/21, Headlocked will feature Lawler and Dumas. Lawler and Joey Ryan will appear on Sunday 7/22. Here's a preview for this week's Impact Wrestling. In this interview Simon Grimm f/k/a Simon Gotch says he wasn't proud of his WWE work: "I'm just not depressed anymore. Mental health is a big part of it. The reality of it is when you're in WWE, if you're not doing work you're proud of or happy with, it's going to wear on you. You're not going to be in the right mindset. Even when you're working hard, you may not be working as efficiently as you could be. The difference of being on the road 200 days a year, flying out Saturday morning and not getting back Wednesday morning."